This post was drafted by Georgia Hingston (External Relations, EMBL-EBI) and edited by me, Jennifer Cham. Members of the Swiss Institute of Bioinformatics (SIB) and EMBL-EBI‘s User Experience team took part in a knowledge exchange on 19-20 September to share ideas and explore how UX design can be further developed within EBI and SIB. 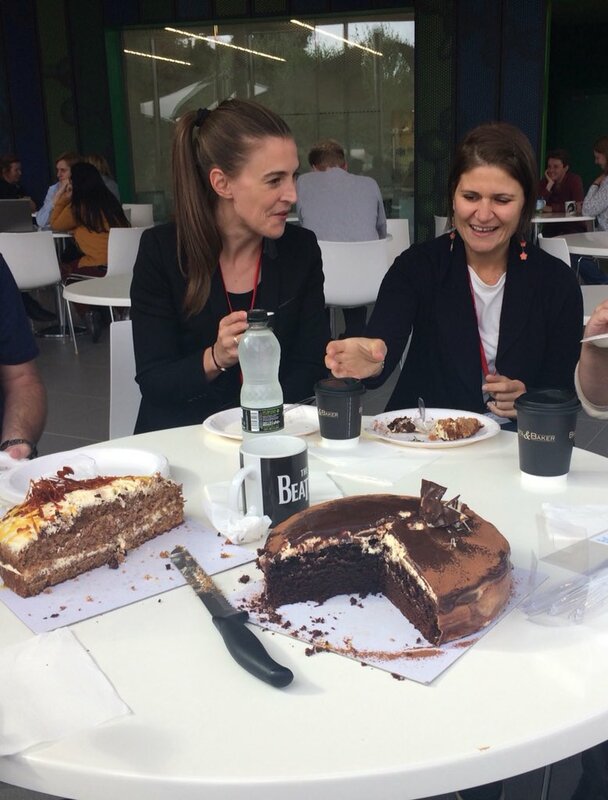 Chiara Gabella, scientific coordinator, and Séverine Duvaud, software developer at SIB, met with EBI’s UX designers and other colleagues at the Genome Campus, Hinxton UK, to discuss the prospects and challenges of developing UX for bioinformatics resources. User experience design (as usual readers will know) focuses on the ease-of-use and desirability of a product or interface. In the case of life science research, this is usually how data is presented and organised on a webpage, and includes the way data is browsed, manipulated and shared. UX in the life sciences presents some unique challenges, and creating effective platforms for hugely complex bioinformatics resources is an ever-expanding task. During the visit, the SIB and EBI UX teams discussed their ideas and approaches that bring success for bioinformatics. Here is a list of the top tips that were uncovered over UX coffee and cake. It is important to clearly demonstrate to scientific data providers why UX design is key to making data discoverable, comprehensible and usable for other researchers. Finding suitable case studies of success, and having metrics to objectively measure the value added by UX, are key to getting this message across. Both the EBI and SIB are project members of the UX for Life Sciences initiative (uxls.org) which has recently launched a UX toolkit to support both of these activities. Collaborating and sharing knowledge with those who have experience in the field enables UX design to progress more quickly, generates new ideas, and is more resource-efficient than going it alone. Making databases quick and easy-to-use is key to making resources effective for the next-generation of biologists. Having a dedicated focus on UX design, independent of scientific research activities, is essential for successful provision of complex data resources. At both EBI and SIB it is agreed that the future success of bioinformatics data resources relies on user experience as well as on the quality and interconnection of data. There is plenty of scope for working together as a wider community of UX-ers to achieve this. Andrew Hercules, Daniel Vaughan and Effie Mutasa-Gottgens for sharing their time and expertise during the knowledge-exchange visit.